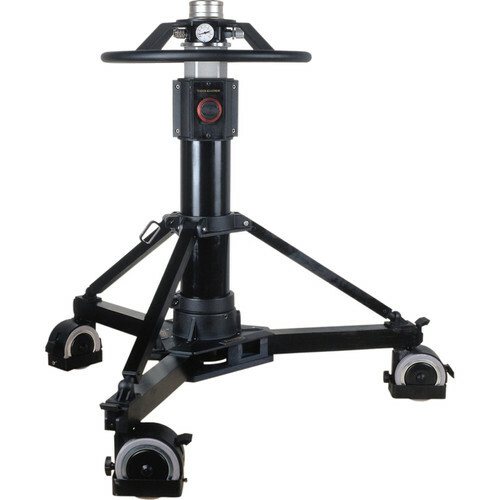 The CARTONI P50 Pedestal is compact enough to go anywhere while being robust enough for handling large studio or OB applications. The P50's lightweight frame provides maximum stability. Its one shot, pneumatic column can be set by using a compressor or manually, with no danger of over pumping due to a safety air pressure valve. The dolly is fold-able for easy transport and comes equipped with 4.5" tires. It can hold up to 121 lbs, making it a premium performer for large video rigs. Anchored by a pneumatic system, it allows for quick and easy height adjustment. Pedestal collapses for easy transport. Allows 19.7" on-shot stroke, making sure you achieve the shot you need. Control the wheels simply by using the durable foot-operated braking buttons. Cable Guards surround the wheels, preventing any wires from tangling around the axles.